An attractive, 19th century, French, walnut, miniature dresser complete with a collection of miniature copper pans. This dresser is a really unusual shape and it dates from c.1860. It has had a couple of repairs to the drawers and these have been done using later nails. There is also a small piece missing from one of the front feet. There are some worm holes in the wood but this has now all been treated. 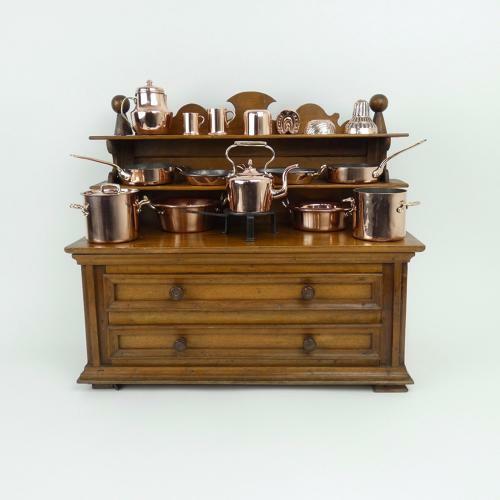 The collection of copper ware is also 19th century, ranging from 1870 to 1900. It includes two preserve pans, a kettle, a lidded jug, two mugs, two stockpots, one with lid, two frying pans, two gratin dishes, four moulds and a steel stand for the kettle. Generally, it is in very good condition but there are a number of very fine pinholes to the tallest of the copper moulds and the lidded jug is slightly dented. The sizes obviously vary but all the items are well proportioned with the dresser. The sizes given are the overall size of the dresser.